Peter could not make war on Sweden until his peace with the Turks was secure, but Denmark and King Augustus had no such obstacles. The latter began operations in February with a surprise move against Riga which failed to take the city, but Denmark fared even worse. Charles XII knocked the Danish king out of the war in a few weeks. Peter kept up the pretense in public that all was in order with Sweden, and no war was coming, even reassuring Kniper personally of his pacific intentions. Kniper could not quite believe that the war would really happen, but he dutifully reported the rumors that war was coming as well as Russian military preparations. Peter could not be sure of the Turkish response, and so in April he decided on an ambassador to Sweden. The eventual choice was Prince Andrei Khilkov, a relative of Prince Romodanovskii and Golovin. Khilkov would have an even more difficult task than he expected, but at the time the rumor was not that he would have the post, but instead Prince Iakov Fyodorovich Dolgorukii, only a few months before in bad odor with Peter over the inadequacies of the campaigns in the south against the Tatars. Kniper went so far as to ask his brother Boris if the rumor was true, and prince Boris denied it: Prince Iakov had too little of the tsar’s confidence for such an important post. Prince Boris was partly wrong, however, for Peter had originally chosen Iakov for the post, changing his mind a week later and appointing Khilkov. Peter preferred to keep Prince Iakov with the army and he remained in the position of general military commissar. In the summer Peter replaced Lefort in his capacity as an army commander with General Adam Weyde and appointed the Georgian Prince Alexander Archilovich of Imeretia to command the Russian artillery. After the official Russian declaration of war on 19 August, Peter lost no time in ordering his army to besiege Narva. The choice showed Peter’s desire for a ready-made port, since Narva was not part of the lands lost to Sweden in 1617. It lay across the old border in the Swedish province of Estonia, and had been the object of Ivan the Terrible’s wars in the sixteenth century. The army command was a mixture of old and new. In June the story was that the supreme commander was to be Sheremetev, and the prince of Imeretia was to command the artillery. In August, however, Peter appointed as Field marshal the boyar and admiral, F. A. Golovin, proven as a capable diplomat and administrator but hardly a military man. Sheremetev received the cavalry, largely the traditional gentry cavalry from Novgorod and some Ukrainian Cossacks. Under Golovin the army was divided into three generalships under three full generals, Avtomon Golovin, Adam Weyde, and Prince Nikita Ivanovich Repnin. All three of them had served before in the Preobrazhenskii guards. The aristocratic Golovin was the same who had commanded at Azov, and before that the two guards regiments. Prince Repnin, who had served as a captain in the same regiment, was still on the road from Novgorod with part of his troops at the time of the battle, so Prince Ivan Iur’evich Trubetskoi replaced him in the line. Prince Trubetskoi was rather different from the former guards officers. A boyar since 1692, he had commanded part of the Azov feet in 1696 and in 1699 was named governor of Novgorod. It was he who signed the messages to the Narva garrison asking them to surrender. As in the case of Iakov Dolgorukii, his relations with the tsar had been troubled, but in spite of that he too received a major command. In the middle of the siege Peter appointed another Field marshal to carry out actual operations. This was Charles Eugene, the duke de Croy (1651-1702), an Imperial general originally from the southern Netherlands who was out of work after the peace of Karlowitz. De Croy was recommended to Peter by King Augustus with a group of other foreign officers, and arrived when the Russian army was already before Narva. 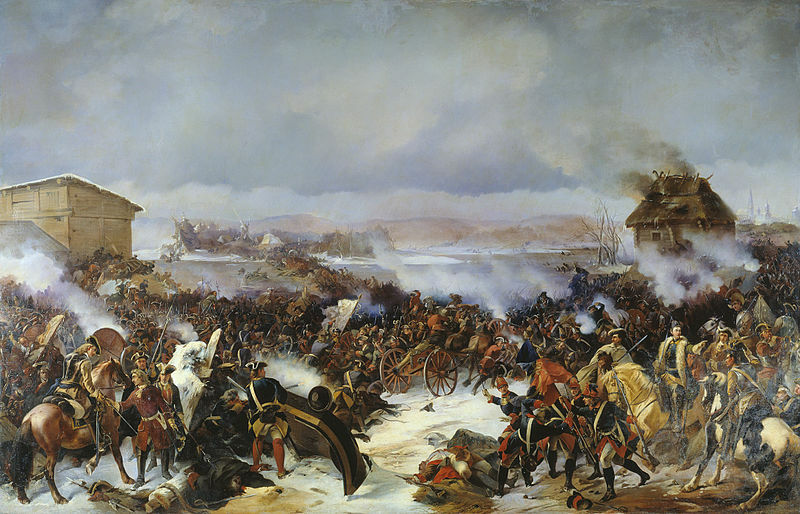 For Peter the siege of Narva in 1700 became a famous disaster. Fresh from his lightning victory over Denmark, Charles XII landed in Estonia in October. As this news reached the Russians, Peter left the army with Fyodor Golovin to return to Moscow, putting de Croy in supreme command. On the next day, 19/30 November, Charles attacked in the snow, and to tremendous effect. He smashed the Russian army, capturing de Croy, A. M. Golovin, Trubetskoi, Weyde, Hallart, Dolgorukii, Prince Alexander of Imeretia, and other Russian generals. Only Sheremetev’s cavalry, the guards, and some of the infantry escaped more or less intact. To Prince Repnin fell the job of reorganizing them and taking up position in Novgorod. Peter had more immediate concerns. The boyars were not pleased with the defeat at Narva, blaming the Danish ambassador Heins for persuading Peter to break so suddenly with Sweden. Prince Boris Golitsyn was prominent among the discontented, not surprisingly as he had opposed the war from the beginning. Fortunately, Charles had withdrawn to winter quarters, so the tsar had a breathing space to reorganize. Immediately after the defeat the tsar ordered Sheremetev with the cavalry to harry the enemy in Livonia. Peter recruited new troops and assembled more artillery and powder, and sent Tikhon Streshnev, the head of the Razriad and the new Military Chancellery, to the Swedish border to supervise. Repnin was assigned to take the remaining troops under his command and help Augustus in Poland. The tsar also took care of the financial basis of the war. In January he revived the Monastery Chancellery under Ivan Musin-Pushkin, with the charge of taking control of the monastery estates, giving a stipend to the monks and the rest to the war chest. He also ordered the churches to sacrifice some of their bells so as to make cannon from the metal. He established a tax on beards, which Pleyer at least saw as a revenue device, not merely a cultural matter. All of these financial moves had the potential to create discontent, especially among the clergy and the pious. These and other recent measures also demonstrated Peter’s desire to move along in a more European direction, as Heins had noticed. Europe, he thought, ought to take care to go easy with Russia rather than reject it, for only time would tell what would become of the country under Peter’s tutelage. During the Great Northern War (1700–1721) Sheremetev proved to be a capable but cautious and sluggish military leader. During the war he was the commander-in-chief and most senior officer in the Russian army. Sheremetev was very cautious in his movements but proved more effective than the younger Prince Menshikov, the 2nd in command whose impulsiveness was not always successful. In June 1701, Sheremetev was appointed the supreme commander of the Russian troops facing Livonia, clearly in the full expectation of war in the region with the king of Sweden himself. That was not to be, for in July Charles defeated the Saxons before Riga and moved south into Kurland, toward Poland, the object of his attention for the next five years. Livonia was left alone to face Peter, and his forces did not wait long. While Charles was making his decision and Sheremetev assembling his army, the Swedish navy make an attempt on Archangel, but it was beaten off. The Swedish attempt reminded Peter of those who went to Egypt in search of mummies and were turned into mummies themselves by the sandy winds of the desert. In the next few years the Cossacks, the Kalmyks, and Sheremetev’s army would lay waste the land to Peter’s great satisfaction. The Swedish commander Schlippenbach was able to win small gains against the Russians, but on 30 December 1701 Sheremetev won his first victory at Errestfer. There were more to follow. Before the last Easter holidays the knight [sc. of Malta] Sheremetev came here himself and in the past Easter week held a meal and ball, which the tsar with most of the Boyars and great men of the country attended, but since the tsar showed himself there to be disturbed and unsatisfied against his custom and soon left, the gaiety was rather disturbed and Sheremetev takes it much to heart. Even success in war did not bring harmony to the relationship of Field marshal and tsar, a state of affairs that may have rejected Peter’s general dissatisfaction with the management and command of his army. The tsar’s attempt to reorganize his army along European lines proceeded slowly, and the boyars were no help, for they were careless and lacked the necessary experience. Peter hoped for better things in the future, for he insisted that the young sons of the Russian princes and boyars go abroad to serve in foreign armies, not just to travel and observe. He considered plans to reorganize the administration of the Russian army into a German-type military commissariat, but for the time being left matters in the hands of the Military Chancellery. In summer 1702, Sheremetev defeated a Swedish army again at Hummelshof near Dorpat, and in the fall the whole Russian force moved for its first great prize, Nöteborg. The voevoda of Novgorod, Petr Apraksin (the tsar’s brother-in-law), began the campaign by clearing the Neva of Swedish troops. Peter brought with him the two guards regiments, twelve regiments of infantry, and massive artillery, all under the command of Sheremetev. General John Chambers commanded the two guards regiments, Prince Nikita Ivanovich Repnin the rest of the infantry and Iakov Bruce the artillery. The siege began in October, and after a few days of fighting the Russian army entered the fortress on 14 October, its first major conquest of the war. The two guards regiments had borne the brunt of the struggle. The tsar ordered that the fortress bear a new name, not the old Russian name Oreshek but instead Schlüsselburg. Its fortifications were hastily prepared and a small exploratory expedition went down river to Nyenskans. Peter decided to postpone its capture to the following year. He set himself to return to Moscow and order new uniforms for the guards, but not before dealing with his commanders. Menshikov received the rank of general, his first important promotion since he became the supervisor of the tsarevich. Peter also cashiered both General Repnin and General Apraksin for corruption (‘einige Malversationes’) and for Repnin’s refusal to serve under Sheremetev. These were the first of many such cases, and both generals were soon to return to important positions. The New Year 1703 brought the completion of the Russian conquest of Ingria, and with it the further rise of Menshikov and greater jealousy of his position in the state. This year the military operations were not so complicated. Menshikov continued work to improve the fortifications of Schlüsselburg and to build boats. By early spring Peter had a large army in the area, the main force under Sheremetev, Chambers, and Prince Repnin and a covering detachment under Petr Apraksin. Nyenskans fell on 1/12 May, and the other Ingrian towns, Iam and Kopor’e, in the course of the summer. The construction of the new city down the river from Nyenskans began almost immediately with the construction of a fortress. The new town would be St. Petersburg. This entry was posted in Russia, Wars by MSW. Bookmark the permalink.